MESOSCALE MULTI-ARRAY technology combines electrochemiluminescence and arrays to bring speed and high density of information to biological assays. In combination with MULTI-SPOT plates, this technology enables precise quantitation of multiple analytes in a single sample requiring less time and effort than other assay platforms. 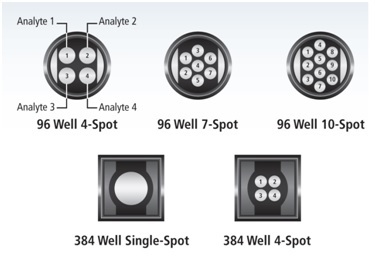 MULTI-SPOT plates, which offer arrays within the well for increased throughput and assay multiplexing, are available in 96- and 384-well formats, with up to 10 spots per well. MESO SCALE DISCOVERY’S unique spot patterns are the hallmark of its MULTI-ARRAY technology for the detection of biomarkers in single and multiplex formats. MSD offers an innovative platform for immunoassays that have ultra-low detection limits, provide up to five logs of linear dynamic range, use minimal sample and handle difficult matrices easily. Combined, these advantages enable the measurement of native levels of biomarkers in normal and diseased samples without multiple dilutions. MSD’s simple protocols and streamlined assay formats reduce workflow without compromising quality.